We received the Bryden Bandweth doll with the DIY glow stick (affliate link) over the Christmas holiday. If you are not familiar with Project Mc2 it is a team of “super smart but seriously cool” teenage girls. They currently have a few episodes on Netflix which Isabella has enjoyed watching and waiting for new ones. These girls use their smarts, love of science and surprising spying skills to solve cases for the secret organization NOV8. 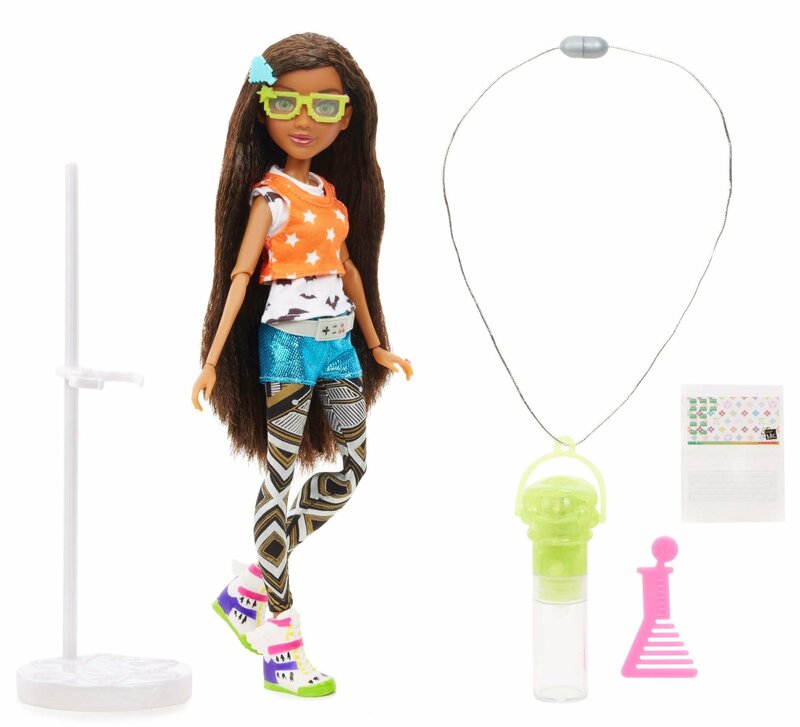 I love that Project Mc2 is all about exciting girls to the wonderful world of science and highly involved in S.T.E.A.M (Science, Technology, Engineering, Art and Math). This beautiful doll comes with an experiment for you to do with the awesome tech genius and social media savvy, Bryden Bandweth. Making your own glow stick necklace using safe household ingredients. It is said that this glow stick includes and ultra violet (UV) light, or sometimes called a “black light” which excited things called phosphors. Tonic water the added ingredient contains quinine, which contains phosphors that turn light we can’t see (the UV light) into light we can. The doll is beautiful and has a completely articulated body meaning that it can move into almost any position, she has little joints in her wrists, elbows, and knees. Bryden is dressed in a totally impressive outfit that reflects her personality and individual style, featured in the show! She has amazing accessories including her clear laptop, glasses, comb and doll stand. This doll is beautiful, one thing my daughter and I both loved was that she was able to be positioned being that she is completely articulated. While this is an awesome feature, the dolls body party fly off frequently and it can be difficult for a little one to put back on. So when she is playing on her own I get a lot of “Mom can you put her leg back on”. We also loved her life like eye lashes, so pretty! She as gorgeous green inset glass eyes and doll eye lashes that accentuate her beautiful face. Although the model/ actor has dark brown eyes and I believe the doll would still be gorgeous with dark brown eyes as well. Her hair is long and textured and beautiful, although I fear after some combing with will be a mess. Her accessories are so much fun and definitely so cute. We love the beaker shaped hair comp although it is not practical to use to style their hair, as it is small. The stand is essential and I wish all of them came with them although they can use a slight improvement as they are not that sturdy,we found that the waist holder slips down and you have to really work at getting your doll in perfect position. Her glasses are designed really cute, my only fear is my daughter will break them trying to get them to stay on her head as they don’t fit quiet right. Her heart shape 8-bit hair accessory is awesome and brings her techy style to life. She wears a belt with a sort of Nintendo inspired game controller design which is “super fab”. You can even alter it to make it a bit tighter or loser, although it isn’t the easiest thing to alter as you have to stick the little peg through the hole so younger kids may have an issue with this. She also has a hot pink lightening bolt ring that is attached to her left hand, it is “adorbs” and pops on and off like any other Barbie ring. The clothes are well sewn, it was a bit disappointing to realized that she didn’t have 2 shirts (it appears to be two shirts layered but it is really one) however she does have a pair of leggings and a pair of shorts. Her sneakers are “adorkable” featuring wings! We couldn’t remove the sneakers though, it was really hard and we didn’t want to keep popping off body parts. Overall the doll is beautiful, there are slight improvements needed but it is a beautiful doll to be treasured by any child or doll collector. The “experiment” if you can call it that, is included with the doll. It comes with a plastic tube with a lid that has a hole so you can take the string and bead at attach it all to have a “fab” glowing necklace. It says that it contains a special “UV” light to help the phosphors found in the tonic water (sold separately) to glow, however without anything in the tube the light glowed did it’s glow stick job. Once we conducted the experiment mixing x amount of water with y amount of food coloring we only needed a tiny bit for the actual light. Which LEAKED! So I felt that it was very wasteful, I also was really upset because it didn’t feel very scientific including a light that didn’t seem to be a “UV” light, just a regular flash light. My daughter was also really disappointed with this “experiment” check it out below! Let us know if you have this or any of the Project MC2 items and what you think in the comments below!